In May we had the honor, privilege and blessing to produce a television program featuring Evelyn Hinds, an actress who portrays Corries ten Boom in a solo stage performance. 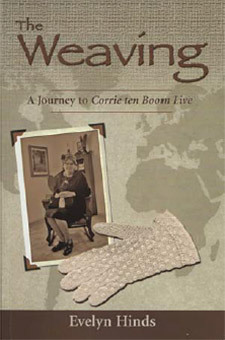 Evelyn has written a fascinating book called, The Weaving, in which she tells the story of how Jesus delivered her from a messed-up life and then proceeded to hand her a ministry of portraying Corrie ten Boom on stage. The title of the book comes from one of the basic stories that Corrie used in the presentation she made all over the world when she was serving as a "Tramp for the Lord," as she put it. She would always tell how God was weaving each of His children into something beautiful, even though to us, our lives often seemed anything but beautiful. She would hold up a piece of material with a mess of threads on the back side, and then she would turn it around and show a beautiful, artistic weaving on the other side. For those of you who may not be aware, Corrie ten Boom (1892-1983) was a Dutch woman who survived the Holocaust and the infamous Nazi death camp called Ravensbruck. She was a Christian who was imprisoned for hiding and protecting Jews in Holland during Hitler's reign. Because she risked her life to protect Jews, she has been designated by the Israeli government as a "Righteous Gentile," and a tree has been planted in her memory at Yad Vashem in Jerusalem, the Israeli Holocaust Museum. My daughter, Rachel, who usually serves as a camera operator during our TV shoots, joined me on the set to help me interview Evelyn. She asked Evelyn to tell how she came to know the Lord. Evelyn said it happened when she came to the end of herself. Rachel also asked Evelyn how she came to be introduced to Corrie ten Boom. We found out that happened when her church showed the film, The Hiding Place, which presents the story of Corrie's life. The most interesting part of the interview to me was when Evelyn told how the Lord called her to start portraying Corrie on stage and how He supernaturally gifted her to play the part. At the time, she was not a professional actress. 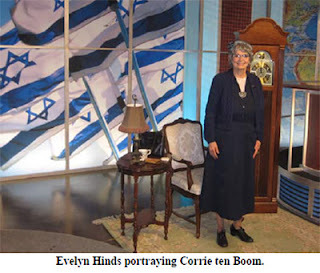 Through the stage production, Evelyn emphasizes the two main themes of Corrie's teachings — God's love for the Jewish people and the importance of practicing forgiveness. Another principle Corrie emphasized was one her father taught her: "Do not hold too tightly to the things of the world, because it hurts if God has to pry your fingers loose from whatever you are holding on to." Near the end of the program, we had Evelyn present one of Corrie's fascinating stories in full costume. She told the story about a miraculous event that happened to Corrie and her sister, Betsy, while they were in the Nazi concentration camp. Corrie had a bad cold, and her nose was running like a faucet. She said, "I wish I had a handkerchief!" Her sister, who had the faith of a child, immediately prayed that the Lord would supply Corrie with one. A few minutes later, a fellow prisoner came to Corrie with a handkerchief she had made that morning from discarded sheets in the camp's hospital. Corrie said that simple gesture was like God tapping her on the shoulder and saying, "I know your suffering, and I am here with you." Evelyn explained that when she first became aware of the story of Corrie's terrible suffering at the hands of the Nazis, she was impacted by the truth that "if Corrie could make it, so can I." She then quoted one of Corrie's most famous lines, and did so in Corrie's Dutch accent: "Der is no pit so deep dat da love of God is not deeper still." We are offering Evelyn's book together with a DVD that contains a brief interview with her and three scenes from her solo stage performance, including the story of the weaving. The book is illustrated with many photos and runs 127 pages in length. The DVD is mounted inside the book. The two together sell for $25 including the cost of shipping. To order, call 972-736-3567 or place your order though our website at www.lamblion.com.